This is a GPRS/GSM expansion board for Arduino. The shield supports the frequency of EGSM 900MHz /DCS 1800MHz and GSM850 MHz /PCS 1900MHz, integrated with GPRS, DTMF and other functions. It also supports DTMF. When enable the DTMF function, get the character feedback converted from the pressed button during the call, which can be used for remote control. 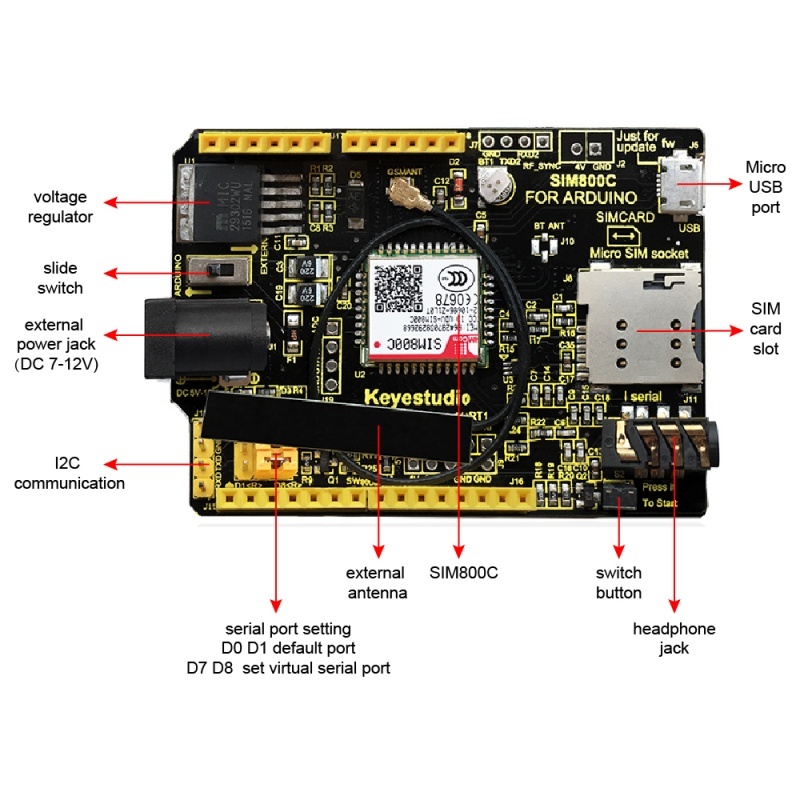 It is controlled by the AT command, you can directly start the function through the computer serial port and Arduino motherboard. 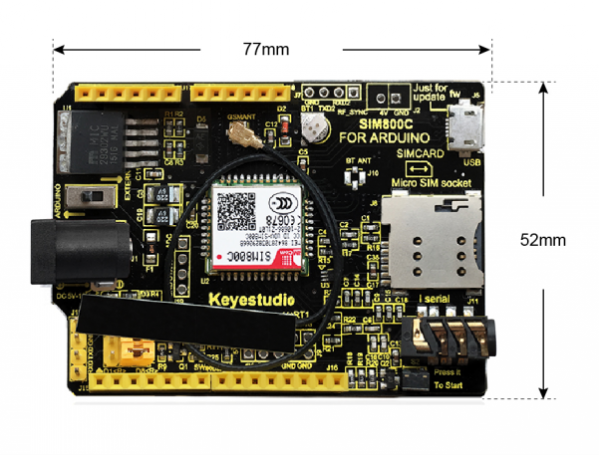 The SIM800C GPRS shield has a built-in SIM800H chip from SIMCom, with good stability. LED indicator for power supply status, network status and operating mode. Below is an example code. Click here to download the libraries. Or you can directly copy and paste the code below to Arduino IDE. //fundebug is an application callback function,when someone is calling. //initialize the digital pin as an output. //initialize SIM800H,return 1 when initialize success. //To obtain the signal strength, return 1 when obtain success. 1. Before compile the code, do remember to add the necessary libraries inside the libraries directory of Arduino IDE. 2. In the code sim800demo.dialTelephoneNumber("15912345678;"), here you can change the phone number you want to dial. 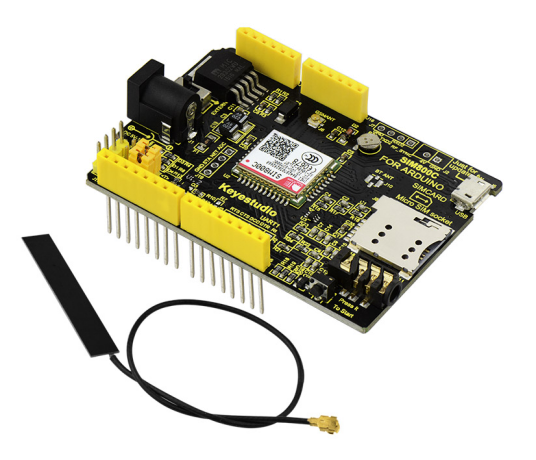 Note: As for arduino IDE 1.0 and latest versions, WProgram.h has been renamed Arduino.h, so this program requires arduino IDE 1.0 or latest version to compile successfully. In the use of library functions, since the received serial data is too large, so it needs to change the original Arduino serial cache buffer more larger. 1.unzip the hardware.zip, if your Arduino compiler is below 1.5.5 version, cut the HardwareSerial.cpp file into Arduino\hardware\arduino\cores\arduino, replace the original file. If it is advanced than 1.5.5 version, cut the HardwareSerial.h file into Arduino\hardware\arduino\sam\cores\ arduino,replace the original file. 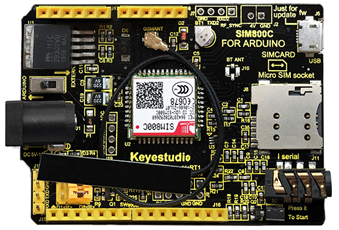 2.If your Arduino compiler is below 1.5.5 version, open the HardwareSerial.cpp file inside the Arduino\hardware\arduino\cores\arduino, modify the # define SERIAL_BUFFER_SIZE 64 as # define SERIAL_BUFFER_SIZE 140. If it is advanced than 1.5.5 version, then open HardwareSerial.h file and do the same modification. 1) Upload the code to UNO R3 board then stack the shield onto UNO R3. 2) Connect the SIM card (2G network), antenna and headphone with mic head to the shield. 3) Connect the jumper cap to the D0 D1, and slide the switch to EXTERN side. 4) Power on the UNO R3 board and shield, you should see the PWR led is normally on. 5) Long press the To Start button, if STA light is on and NET light flashes, release the button. 6) Wait for 1-2 minutes, it will call the number set well. 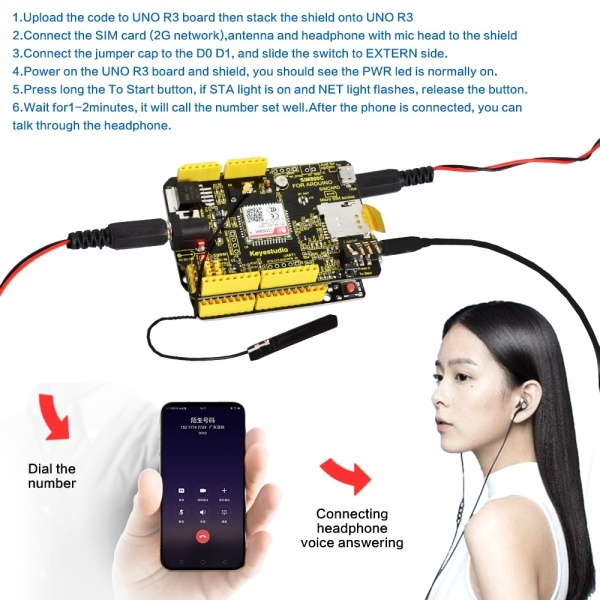 After the phone is connected, you can speak through the headphone. This page was last edited on 18 April 2019, at 13:17.